While India celebrated its 72nd Independence day on August 15 for getting its independence from the British rule in 1947, world countries showed their sweet gesture for the Indian Independence day by showing Indian Flag at various places. The tricolour flag has been displayed through lightings and decorations at some important spots of the world. 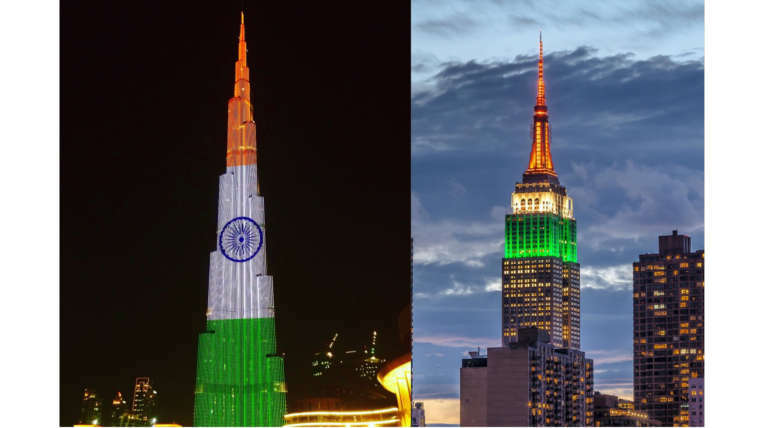 One of the World’s most famous building in NewYork the Empire State building soaring 1,454 feet lighted its top with the Indian flag and posted the photo on Twitter. Burj Khalifa in Dubai which is the tallest building in world decorated the building glowing with the Indian Flag and celebrated Indian Independence day along with India. Followed by the lighting effects of the flag in the Niagara falls in Canada and various other places of the world honoured Indian Independence day by making the Indian flag displays. Happy India Day from New York City! Together with the Federation of Indian Association, we�re honoring India�s Independence Day by recreating the Indian flag in lights tonight. ? ?